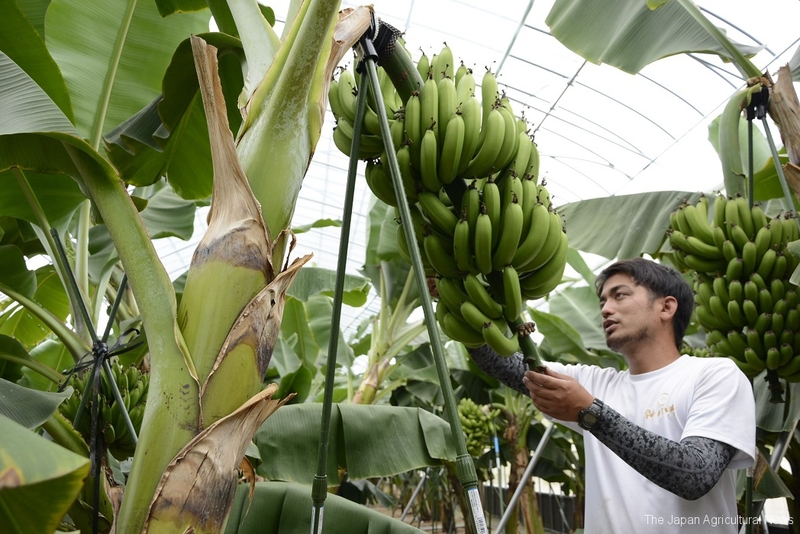 A farmer takes care of bananas in a greenhouse at Kami Banana farm in Minamikyushu, Kagoshima Prefecture. 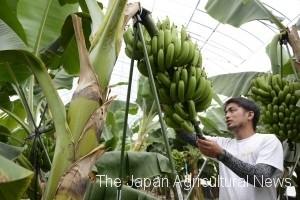 A farm in Higashihiroshima, Hiroshima Prefecture, began producing bananas last year. At a sales campaign held in May at Sogo department store in the city of Hiroshima, the farm sold out 450 bananas in two days. It plans to sell the bananas at a farmers’ market of a local farm coop JA Hiroshima Chuo, aiming to ship some 10 tons a year. The farm grows bananas in two greenhouses, about 7 meters high, totaling 23 ares in area. It planted 500 seedlings in June last year and ships the fruits after ripening them at its facility. Its bananas reach more than 20 degrees Brix in sugar content, with rich fragrance and creamy taste. After the banana production business gets on the right track, the farm plans to open a tourism farm to help revitalize the community.